Today I am participating in a fun NEW challenge! 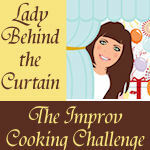 Sheryl from Lady Behind the Curtain is hosting The Improv Cooking Challenge and this is the very first month!! At first I was a little nervous that we would be given crazy ingredients that we would have to somehow find a way to use together (think Iron Chef or Chopped), but no we are assigned two delicious items that pair wonderfully with each other leading to endless possibilities of creations. Click on the image below for more details (and to join in on the fun). This month we were assigned Caramel and Apples! Growing up we had a small apple orchard. Every year we would make homemade cider, applesauce, dehydrated apples, and frozen pie filling. We would also eat lots and lots of fresh apples. Personally, I preferred the really really sour apples with a sprinkling of salt or a nice crisp tart apple with a little (or lot) of caramel sauce. For this challenge I decided to try Caramel Apple Pie Popcorn. The tart dehydrated apples are perfectly paired with the sweet and chewy caramel popcorn. Add in a few toasted almonds and a sprinkling of cinnamon. And we are left with a fabulous fall dessert. And if you don’t feel like eating the entire batch yourself, I suggest bagging it up and delivering it to friends and family (not only is it great for fall, but it would also be a great holiday treat). The original caramel corn recipe is a family favorite. My Mom especially loved using this recipe because it only calls for ingredients that we always had at home. Cook brown sugar, white sugar, Karo syrup, water, cream of tarter and margarine to softball stage. While caramel is cooking, pop popcorn and toast nuts (if necessary). Combine popcorn, apple slices, nuts, and any other ingredients in a very large bowl and set aside until caramel is ready. Add baking soda and stir vigorously (be careful as the mixture will bubble up). Quickly (and carefully–it will be HOT) pour the caramel over popcorn mixture while stirring. You might need to start with only half of the popcorn and add more once it is coated. I had to use two large bowls since I didn’t have a large enough bowl. Spread mixture onto a foil (or parchment) lined cookie sheet (jelly roll pan). Sprinkle with cinnamon and salt (if desired). Eat and enjoy! If you like your caramel corn crunchy, you can bake it in a 250°F oven stirring every 10 minutes for about 30 minutes. To check if it is done, remove a piece and let it cool (it will be harder after it cools) and see if it is your desired texture. *I used homemade dried apple slices using tart cooking apples in a food dehydrator. You could also dry the apples in your oven using these instructions from Serious Eats. You can also buy dried apples from the store. I’ve noticed them in the produce section. **To toast nuts, spread them on a baking sheet and toast them at 200°F for 5-10 minutes. Stirring a couple of times. Be sure to check out all of the other fabulous caramel and apple treats linked below!! I am also doing a double post today, so if you want, I would love for you to take a look at my Double Chocolate Mint Chip Brownie Cookies. This entry was posted in Candy, Other Sweet Treats. Bookmark the permalink. I never tried anything like this! And it looks awesome! Stopping by from the challenge — you have a fun site here! Yummy! I wanted to make some caramel apple popcorn for the challenge and I’m glad I changed my mind, because I’m super excited to make your recipe now! Looks delicious Thanks for sharing! Wow, you just blew my mind. What a great popcorn flavor!! What a great idea! Looks sooooo good! I love popcorn snack mixes! And my husband, who typically doesn’t go for sweets, also loves it, so I’m always looking for different combinations. This looks like a great one! This was a fantastic idea!!!! Love it! Thanks for the inspiration! Thanks for the nice comment you left on my blog. I see we are both doing 12 Weeks and the Improv Cooking Challenge. This popcorn mix look great. I never even though about using dried apples. What a good idea. This is definitely going on my “to make” list. I love snack mixes of any kind. Thanks so much for the link for drying apples in the oven. This looks fabulous! Such a great flavor combo, we love popcorn and I’m sure this treat wouldn’t last long! I LOVE your recipe!!! Thanks for participating in THE IMPROV COOKING CHALLENGE! I can’t wait to see what you make next month with Pumpkin and Cream Cheese! My guys would totally inhale this popcorn! I was thinking of whipping up something like this for the challenge, but my popcorn always seems to break when I stir caramel into it. (Not that the boys wouldn’t do away with the crumbs…) I will have to try your recipe. Thanks! I would love to snack on a bowl full of that popcorn! It sounds so good. What a clever idea to add the dried apples! This sounds soooo tasty. Wish I had some right now! What an awesome and unique recipe! What a great idea to add apples to caramel corn. Love it. And what a great round up of so many caramel apples treats! Dried apples in popcorn! wow I can’t wait to try it. I LOVE the combination of apple and caramel – and I was just wondering how to make nice popcorn to save money as I’m currently addicted to this shop stuff which is fairly pricey – so this recipe is perfect, thank you very much! What a fun fall treat! That’s a great way to use two amazing flavors. I featured this recipe on Fun Friday Finds today. I hope you can stop by and grab a featured button. Thank you!! You made my day! I’m glad you enjoyed my recipe! This looks like the perfect party snack… yum! Sounds like the caramel popcorn my mom used to make — but she didn’t add the dried apples. I think that would be a very nice addition though. What a neat idea, adding dried apples to caramel corn! Very clever! I only like homemade caramel corn (I’m picky like that), and yours looks fabulous. Oh my, this one caught my eye right away. Heavenly! I’m pinning it to pinterest ASAP! Thanks for stopping by my blog! This was such a fun challenge! Such a fun and creative way to use the required ingredients. If you haven’t already, I’d love for you to check out my Improv Cooking Challenge recipe: Caramel Stuffed Apple Cider Cookies. I would love a big bag of this carmel apple pie popcorn heaven! Great job on this creative creation. Yum, this looks so good! How creative! This is brilliant. I love this idea! I am all about popcorn! This is simply fabulous. What a great snack to have around with the best flavors. You came up with an original and creative treat for us. Thanks for sharing this. What a great fall treat! Oh, my gosh, this looks amazing!!! I don’t even like to have caramel corn near me b/c it’s one food I cannot resist. And adding apples just makes it even better. I seriously need to find a reason to make this…I don’t know why I didn’t see this on the 20th!!! But I’m so glad I now have this recipe…thank you! What a great twist on caramel corn. How creative!! I have a bunch of dehydrated apples and am looking for ways of using them up. TFS! My mouth is watering!! That looks so yummy. My kiddos love popcorn. Thank you so much for the comment today! YUM-O!!! I’ll take a big ol’ bag…RIGHT. NOW. Thanks for visiting my blog today! love the sound of this caramel corn!!! i am a huge popcorn fan and am always looking for fun new recipes for popcorn….thansk!!!! What a unique twist on caramel popcorn! I’ll have to try it for our families movie night soon.